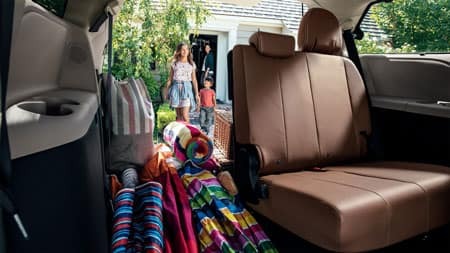 The 2019 Toyota Sienna is the minivan that the whole family can finally agree on thanks to its dynamic exterior styling, refined interior, and class-exclusive available All-Wheel Drive (AWD) system. A revised front end with more aggressive upper and lower grille openings give the 2019 Sienna its eye-catching profile. Sienna prioritizes your safety with standard Toyota Safety Sense™ (TSS) – a bundle of active safety features designed to protect you from the unexpected. 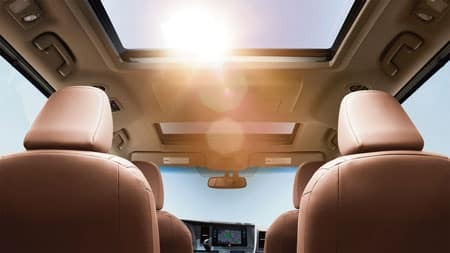 Inviting soft-touch seating surfaces, optional premium contrast stitching, and an array of advanced tech features help make the interior of the Sienna luxurious and welcoming. With the available Entune™ 3.0 App Suite, drivers can enjoy access to Yelp®, OpenTable®, Pandora®, and several other fun apps. Help eliminate boredom with the optional Dual-View Blu-ray Disc™ Entertainment Center which delivers a 16.4 inch display to keep passengers occupied as the miles fly by. 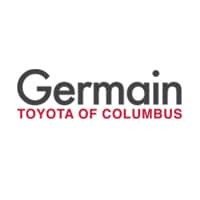 While updates to the Toyota Sienna are relatively minor for the 2019 model year, shoppers will still find some impressive additions to the lineup. 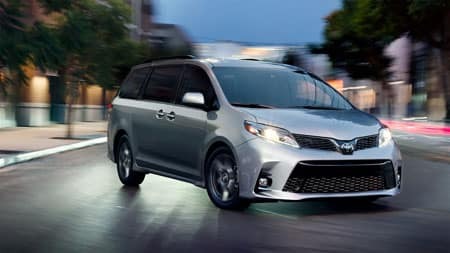 As the only minivan offered on the U.S. market with capable all-wheel drive, Toyota has expanded the availability of this feature to SE Sienna models. Apple CarPlay® compatibility also makes its debut on the Toyota Sienna this year, standard across all trim levels. 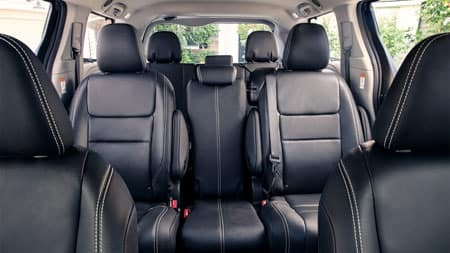 Numerous available seating configurations offered in the Toyota Sienna help you customize the interior to suit any type of adventure. Getting to the third row is effortless thanks to second row seat cushions which tip up and slide forward effortlessly. Although the Sienna offers seating for up to 8, the eighth seat stores securely inside a cubby in the cargo area for expanded cargo capacity. Optional second row captain’s chairs come equipped with adjustable ottomans and armrests for unmatched comfort on those long road trips. 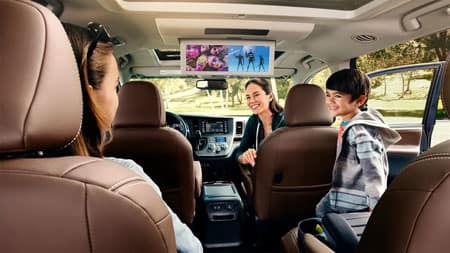 Offering spacious seating for up to eight, the Toyota Sienna features a luxurious interior which provides plenty of comfort features that the whole family will enjoy. A color-screen display mounted in the center of a wide, flowing dashboard makes it simple to monitor a selection of amenities in the Sienna. Simple-to-use digital display climate controls give you the ability to adjust all three zones of climate control with ease. Available Driver Easy Speak has an integrated microphone up front that can recognize your voice and transmit it to rear-seat occupants while keeping your eyes safely on the road in front of you. A total of five USB ports are scattered throughout all three rows of seats to keep everyone’s electronic devices charged up. Available second row captain’s chairs and leather trimmed seating surfaces allow passengers to relax in complete comfort. A revised upper and lower grille design gives the Toyota Sienna a more aggressive appearance to help you stand out from the ordinary. For even more style, Sienna SE helps turn heads with a sport mesh front grille, lower side rocker panels, and 19-inch 6-spoke gunmetal-finish alloy wheels. Standard power comes in the form of a 3.5-liter V6 DOHC engine that delivers 296 horsepower for responsive and efficient performance. Perfect for when Mother Nature doesn’t cooperate with your plans, the Toyota Sienna remains the only minivan sold in the United States with an available All-Wheel Drive system. 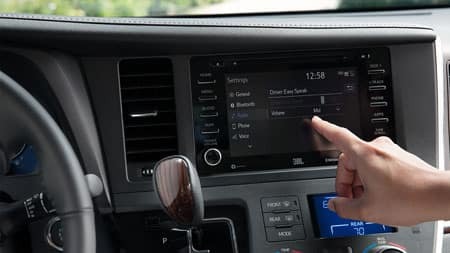 A standard high-resolution 7-inch touchscreen display is your gateway to the new Entune™ 3.0 system inside the Toyota Sienna. Standard Apple CarPlay® compatibility lets you bring along the power of your compatible iPhone®. Using the standard App Suite, drivers can use their favorite apps including Yelp®, Pandora®, and OpenTable®. Available Wi-Fi Connect Powered by Verizon gives you the ability to connect up to 5 devices to stay connected while on-the-go. Squeezing into a tight parking spot is easy with the available Panoramic Camera and Bird’s Eye View Camera with Perimeter Scan. These sophisticated cameras give you a clear view of what’s behind the Sienna, showing both your distance and projected path. 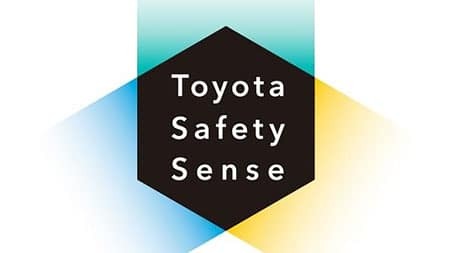 Developed to help keep you and your passengers out of harm’s way, Toyota Safety Sense™ (TSS) is a collection of active safety features included as standard on every Toyota Sienna model. These helpful advanced technologies include Lane Departure Alert with Steering Assist (LDA w/SA), Automatic High Beams (AHB), Pre-Collision System with Pedestrian Detection (PCS w/PD), and Dynamic Radar Cruise Control (DRCC). Active headrests, eight standard airbags, and 4 LATCH (Lower Anchors and Tethers for Children) locations provide additional support. Optional Safety Connect® gives subscribers access to Toyota’s call center for Automatic Collision Notification response, Roadside Assistance, Stolen Vehicle Locator services, and Emergency Assistance.